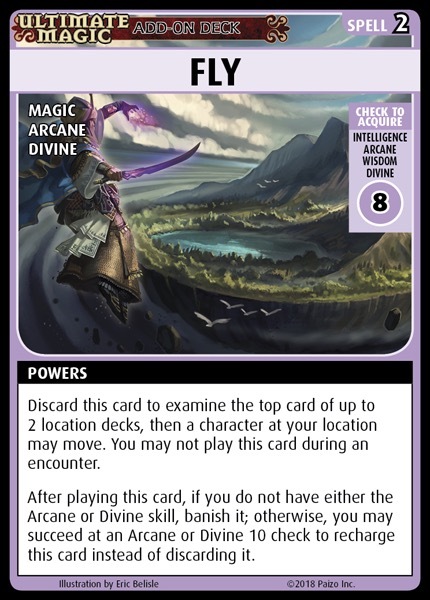 Ultimate Magic is another solid example of our highly complex process to stuff every super-awesome thing we could think of into the Ultimate Add-On Deck series. Good luck prying the spellbook out of her hands. 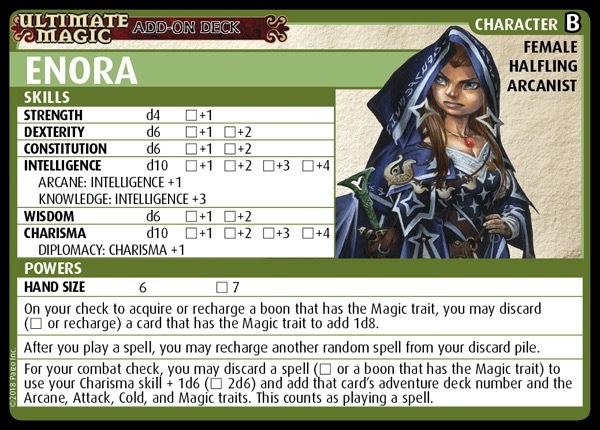 I've previously mentioned that Enora is one of my favorite characters, though I'll admit that I like all kinds of characters with lots of card variance, deck cycling, and a versatile toolkit. 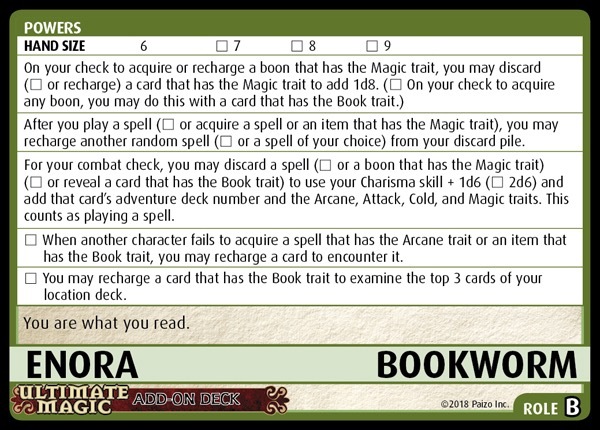 Ultimate Enora hits a lot of great notes, just like Wrath Enora, and she's even got an impressive array of awesome books to accompany her. Whichever role you pick, you're still awesome. I once described Enora as supercalifragilistic-Librariana-docious, and I'm pretty sure any version of Enora I make is going to get some kind of book-related role. 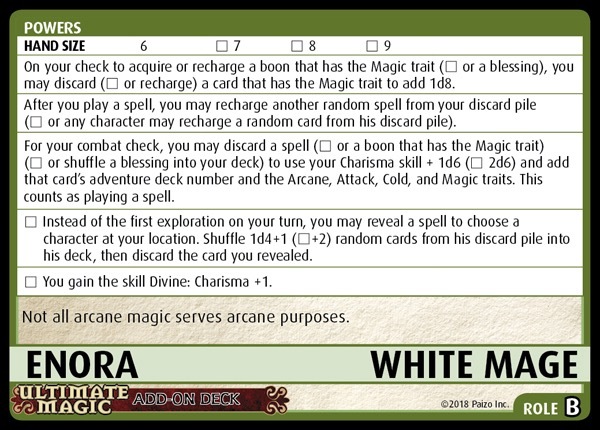 This Enora also explores her worship of Nethys and turns into a fairly excellent healer with her White Mage role. Got a problem? Ice and Fire will solve it. 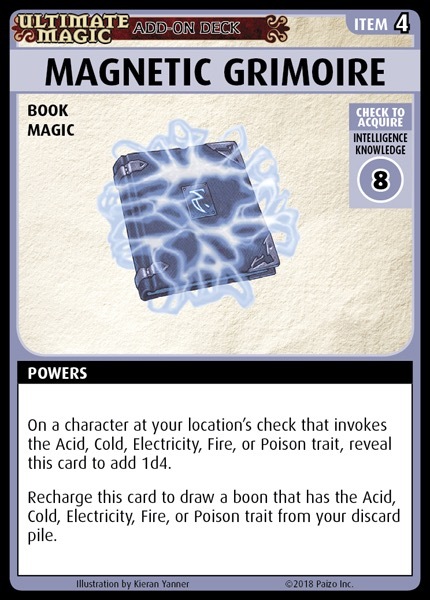 Ultimate Magic is filled to the brim with spells. 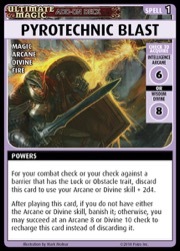 There are a ton of spells of all kinds to spice up any cleric or wizard's deck. 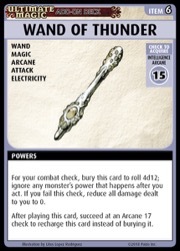 This is especially true for Attack spells, which are represented in every single adventure deck number. 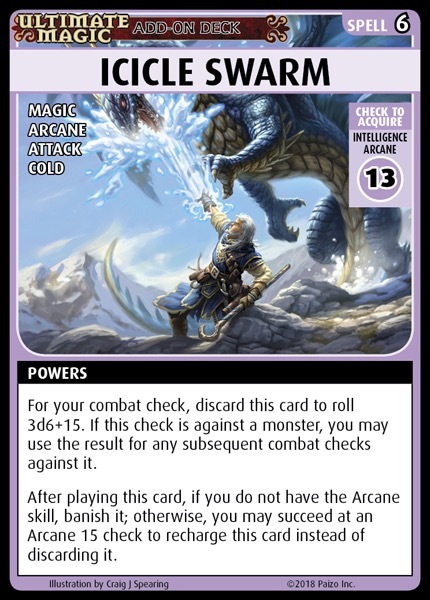 There's also a new cycle of spells that includes Icicle Swarm, which caters well to casters who might need to defeat a multi-check villain, and also to sometime-casters like the Magus or Bloodrager who might see benefit from a solid replacement dice expression. Not every problem is solvable with destruction, but every problem has its spell. 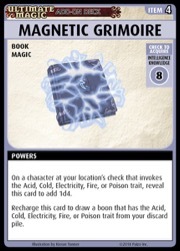 Of course, many of the spells are useful outside of combat as well. Fly is a fantastic way to do a little bit of scouting from above, then go to the best location. 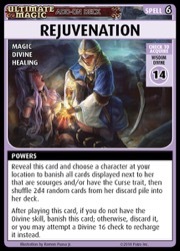 Rejuvenation is the most powerful solution in the game for all that ails you. Sometimes you need an outfit with a bit of flair. While spells are a huge chunk of this deck, we couldn't possibly stop there. 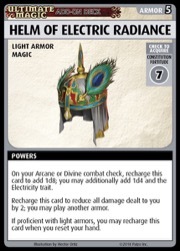 We have an assortment of caster-appropriate armors and items. 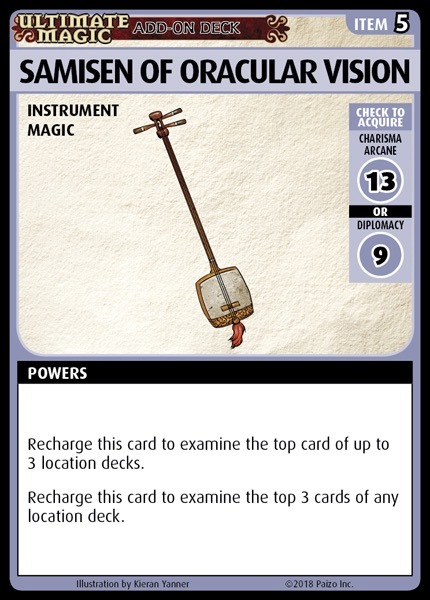 What bard wouldn't like to wander into a tavern with a gorgeous hat and an incredibly useful instrument? 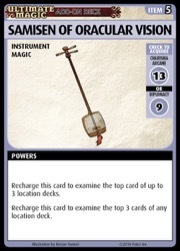 The right magical tool for the right magical job. 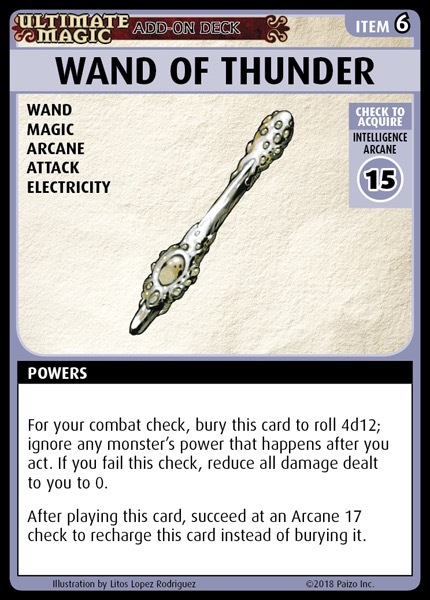 Ultimate Magic also has a ton of useful items, including more awesome staves and wands than you can shake a magical stick at. 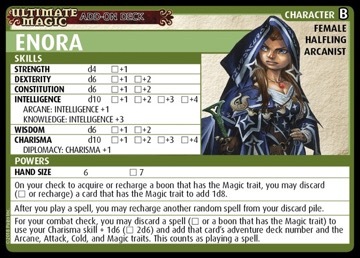 There's also a hefty cycle of powerful books for knowledgeable casters like Enora and the Pathfinder Tales Character Deck's Varian. You can almost see the journey from child to adult here. 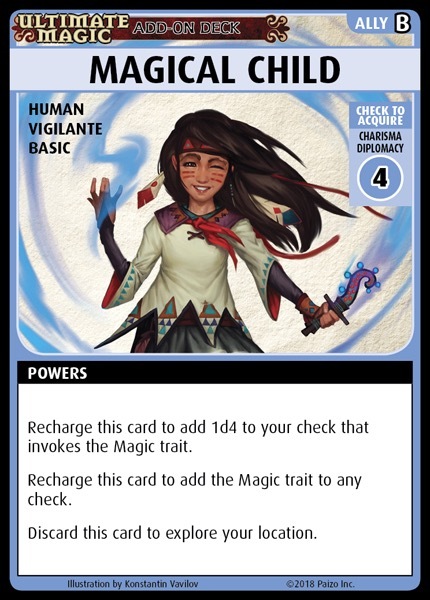 As for allies, Magical Child is a highly useful and adorable card for anyone. You might be a little confused by that "Vigilante" tag but, with the help of her magic costume, powers, and pet friend, she is totally fighting crime and making the world a better place! On the other end of the spectrum, Autumn Witch is ready to offer fabulous power to any caster who might need her assistance. The gods of magic have got your back. Or at least your existential ability to alter reality. 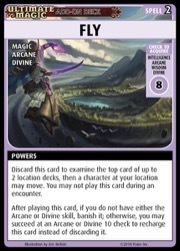 Assuming you like to reliably recharge your blessings, you'll find Blessing of the Spellbound fantastic for all of your Arcane and Divine needs. 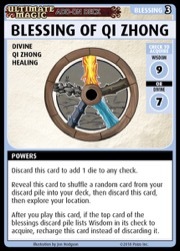 Qi Zhong is the Tian Xia deity of magic and healing, and he's going to be very helpful for all your exploration needs. 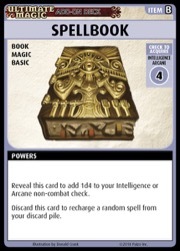 You'll also find upgraded blessings of the Master of Masters, the Seventh Veil, and the All-Seeing Eye. I hope you'll find this deck truly magical! Next month we're going to show off one of the craziest characters we've ever made, along with an impressive array of boons, in Ultimate Intrigue. The art looks amazing! 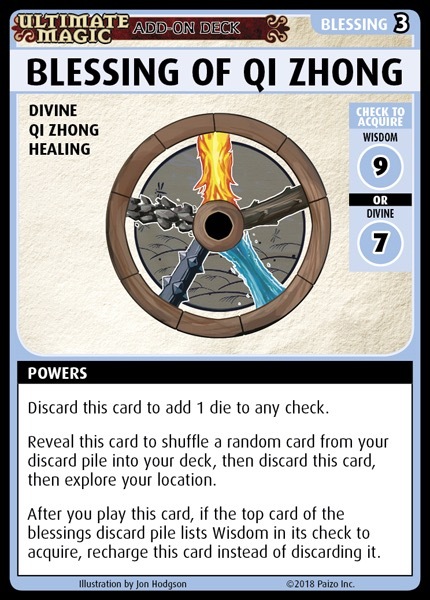 I love the Blessing of Qi Zhong's element wheel. 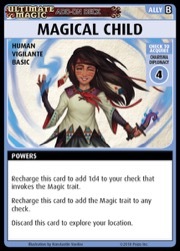 Magical Child is also awesome! Really cool stuff! Rejuvenation is the bees knees. Myself, I'm excited about all the Ultimate decks. Super excited for this one. Enora was a favorite of mine as well. I think this will be my next organized play character. Some really cool spells from the looks of it. I like the Icicle Swarm ability. 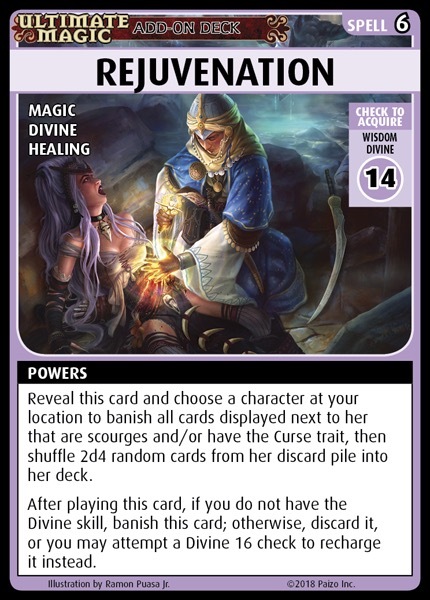 Fly seems really good for a spell2 slot, and the healing/scourge removing boon for class decks will be nice for organized play. Overall nice work, excited to get this one in hand! 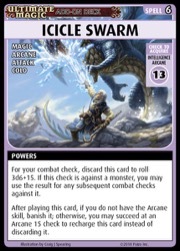 Looking forward to this deck! Completely agree. For anyone who's interested in the choice of elements, it goes back to Wu Xing, which is an underused alternative to the traditional Fire/Water/Earth/Wind elements that are mostly used in fantasy. I'm disappointed that the magical girl's adorable pet lion isn't in the picture... If you're not familiar, go look in the ultimate Intrigue deck! "This is especially true for Attack spells, which are represented in every single adventure deck number. " This was just beneath the Pyrotechnic Blast. So... is PB *really* intended NOT to have the Attack trait? Just sleeved mine last night. Ah, how I wish this'd been around when I ran Darago through Season of the Runelords. Ugh, no. It should have the Attack trait. Blog curse strikes again. I'm excited for this. 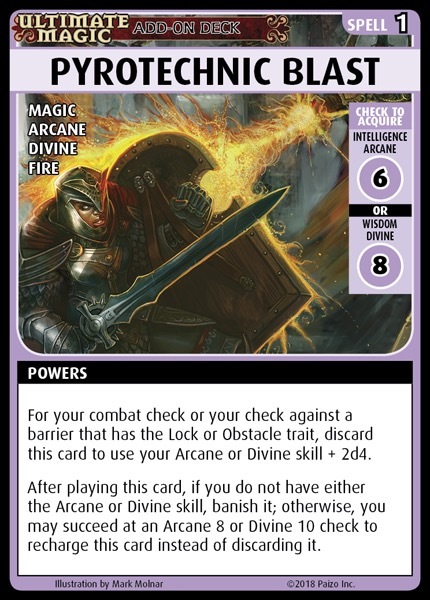 There's a few characters in class decks that feel like they should have access to attack spells that don't (Like Uliah in the Warpriest Class deck). This seems like its an excellent way of getting around that limitation. HA! I love it. Thanks for the preview...I did ask for one in this product discussion. Thanks again. Looks as though it may be the first Non-AP deck I purchase! I was a little disappointed with the spell selection, to be honest. 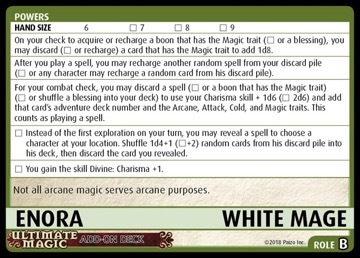 I was really hoping for a Haste or a spell with a similar explore mechanic, since that's what was most sorely missing from the Wizard class deck. I loved the new blessings, however. Lem needed this deck so badly in organized play Wrath of the Righteous. These Ultimate decks really do add a lot of range to each and every class deck. The two so far have been wonderful; can't wait to see the others. Seems like there is a fair amount of divine stuff in here as well. 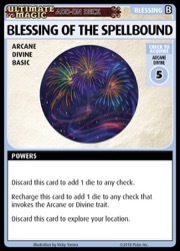 I would love to play a divine character who is a spell powerhouse. I only wish Blessing of the Spellbound didn't have the Divine trait so that Mummy's Mask Ezren could take more advantage of the deck. 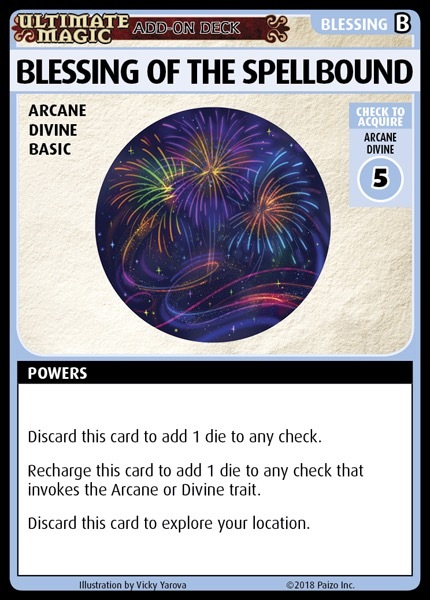 Ultimate Combat has a non-Divine blessing. 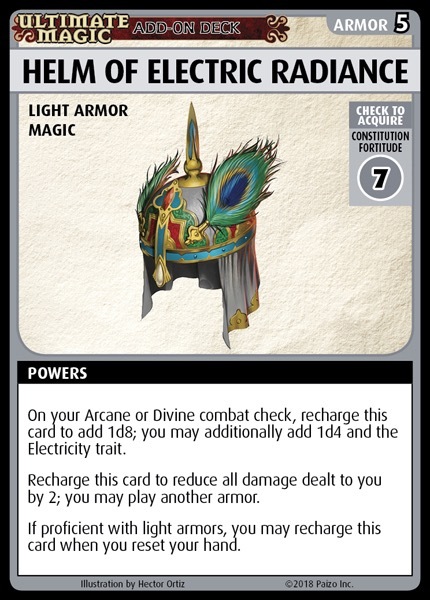 I'm hoping there might be some options in Ultimate Equipment or Ultimate Intrigue as well. I suspect that Ezren with Ultimate Intrigue would nicely fit your style of playing him, Hawkmoon. 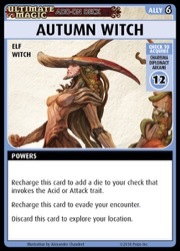 Any idea when we can expect a pdf of this deck's character sheet and deck list? These are really handy to have for organized play.